My friendship with Susan Hawthorne, writer and publisher at Spinifex Press – the author being celebrated here tonight at Muse – stretches back over decades now. I can assure you that we have done a great deal of hilarious laughing over those years, and I am emphasizing that humour at the outset because the subject matter of Susan’s novel isn’t funny, it’s confronting, which is a little tough on the person doing the launch. Susan’s novel is deeply involved in the dark matters of torture, but I remind you at the start that this is creative writing, this is the creation of a textual art space, this is the business of the artist, to take the reader to hard places and bring them out again. This is not torture, this is art practice, a novel of exploration of dark matter. FORM. The form of the novel is striking. The first visual impact of the novel on the reader, its physicality, is of scattered fragments on the page, scraps and movement, not a continuous unfolding narrative. This is a puzzle, a mystery building over time and place, locked inside several brains and memories. The reader is a participant from the start, sorting out the puzzle. You cannot sit outside and observe, you enter and try to sort out the fragments. Time sequences shift, you don’t know what’s happening, the gaps in the paper on the page create the presence of the book’s most important presence, SILENCE. There is a lot of Silence, of unknowns. And yet the text is unified, there is a story, there is a kind of shifting reality, it emerges fitfully, it is visible. There is sound, vibrations, Voices, broken bits of lives and possibilities. Three narrators act as a broken chorus and lead us through a horror story of sorts, across complicated time, geographies, memories, inventions. Deeply individualised and yet linked to broad political events, there are threads of a common story among women somehow reunited in the crazy maze of patriarchal overlay, from one girl’s curiosity through family explorations to the terrible history of whole countries. LANGUAGE. In all of Susan Hawthorne’s writings across several genres, language itself is her central engagement. She has a core fascination, creatively and as a scholar, with all kinds of language; text, signs, symbols, sounds, body language, sound language, animal language vegetal consciousness in general. She is also a scholar of Ancient Languages, the archaeology of language, visual verbal, and held in Silence. This stretches also to made-up language, Origin Myths about words. Underlying all that word focus flows the great river of women writers and artists, the long line of women, known and unknown, the women writers and artists that are her/our heritage. In all the previous books of poetry and a verse novel including Cow (2011), Limen (2013), Lupa and Lamb (2014), Earth’s Breath (2009), The Butterfly Effect (2005) these rich voices of the past echo and reinvent themselves in the pages, an intertext of women’s creative heritage, and the core of Susan’s feminism and lesbianism. In this new novel too, they are layered into the text in subtle and obvious ways. Here are language fragments from the deep past, women’s cultural threads sometimes open sometimes hidden away for survival, here is CODE, hieroglyphics, pictographs, scratches of meaning and messages. Susan has indeed chosen to write in many forms over the last few decades – essays, poems, novels, theory, a quiz book, translation. What unites all these structures and ways of speaking is her core vision, and she has found multiple ways to show us what she sees, what she knows, what she wants, what she doesn’t understand, and what pains her. I know she has been carrying around a version of this novel a long time, and so now it is here, Dark Matters. I wonder, why now it emerges? Why the novel form now? This is in fact her first return to the form of the novel since The Falling Woman back in 1992. My own speculation on this question is because this form allows a lot of freedom to incorporate all her ways of seeing. It seems to have a looseness that can fold many things into it, unlike a poem, freer than a long essay, released from the disciplines of factual reality. As a novel, it is deeply poetic, almost in parts a kind of prose poem. Susan has created a tool that can invoke multiplicity and looseness. There is here Voice, story, memory, myth building, myth recovery, invention and certainly deep POLITICS. This is her territory and always has been in our long association as friends, political allies, creative sisters, and for me as a reader of the work. A World is Remembered, Created new, Reimagined, And We are in it, Susan’s line. The intertext presences in this novel are layered, dense and subtle in parts and sometimes right in your face. Sappho of course, the great ancestor, plus Stein, Woolf, Monique Wittig, Mary Daly, Leonora Carrington (the hearing trumpet appears), the women of the Surrealist movement. The beloved literature and art of our generation of lesbian artists and writers and scholars is all here, woven into the textual underlay. On TORTURE. There were matters that I needed to think deeply about and address here tonight, on the ethical depiction of horror and torture. We are surrounded by this material in popular culture but for the artist they are serious themes to consider. How to represent this creatively? How to be transformative, and not just dump trauma on the reader? How to convey horror and yet also be effective? How does this function for a woman writing about women and torture, how to write about it? The torture of lesbians and women has been part of the Great Silence, but how to convey it with power and responsibility, not as desensitized or voyeuristic or pornographic? This is not a new question and women writers have considered it in many ways. In a recent book about Hannah Arendt, Susan Sontag and others, (Tough Enough by Deborah Nelson, 2017) the author says “Causing Pain to the Reader is sometimes acceptable.” The 20th C, a century of trauma was also one of traumatic representation. “The problem is not that we do not know what is happening but that we cannot bear to be changed by that knowledge when we do know.” Now in the 21st C, an escalation and normalization of torture presents this to artists in a whole new way. How do you write about it? What form do you choose? Writer and Sculptor Kate Millett, who died only recently, also puzzled over how to convey torture and cruelty, in her books The Basement (1979), about the torture and murder of Sylvia Likens in 1965, and also in The Politics of Cruelty (1994). But it was in her Sculpture, in the non-verbal space that she explored the Uses of Torture most powerfully, creating a world of inner and outer captivity, programmatic torture. Susan Sontag, in Regarding The Pain of Others, addressed this question of torture in photographs, considering how Virginia Woolf in her book Three Guineas chose which photos of dead children in the Spanish Civil War not to use. The point is that artists and writers make choices, ask what the purpose and limits are in recreating the dark matter of torture. How has Susan thought and written about this? I know she has considered it for many years. We have talked about it, as she has sought out and researched torture particularly about lesbians. In this novel she has made choices, great ones. It is graphic and powerful but somehow it also cleans and transcends and empowers the reader. Certainly it did me. The body sensates the realities of torture in complex responses, fear, pain anticipation, creative dissociation, and the brain is very present. We are of course outsiders but we are made to be there and think through the matter, the dark matter, and stay grounded and still think about what is happening. Always we know deeply this is art space not a torture room. The Story of Lesbians on Planet Earth preoccupies some of us very much, it being a fugitive tale with uncertain outcomes and endings. Attacks on the very word and language of Lesbian in the 21st C are a new challenge. Lesbia Sapiens Magnificata as a Form finds itself under threat again, the very word. Susan in this novel invokes “an Imaginary Encyclopedia about Lesbians. A Universe in which lesbian symbols lie at the centre.” This I think actually describes all her work. The novel echoes all her previous work and takes a courageous step into territory made invisible by old fears no longer able to be contained. The times of Silence are over. As to Susan’s larger project. Spinifex Press is a remarkable experiment in feminist publishing, a triumph of survival. It continues to produce clear voices in real books in hard times. It is its own kind of marvellous reality, and I celebrate the books and the women. Suzanne Bellamy is an artist and a scholar. She has produced works in porcelain for many years. Her prints often reference artists such as Virginia Woolf and Gertrude Stein. In 1996 she created the art performance/ archive installation The Lost Culture of Women’s Liberation 1969-74, the Pre-Dynastic Phase, an archaeological, activist women’s history project, which has now been presented many times both in Australia and in the USA in museum or slide/performance format. 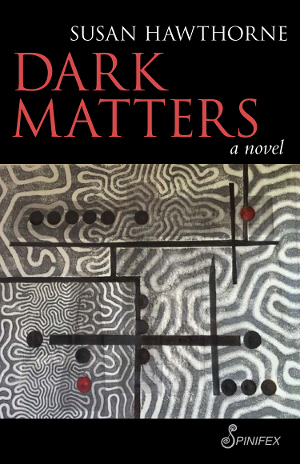 Suzanne Bellamy’s artwork appears on the cover of Dark Matters (Road Map 2004. Etched embossed monoprint on Fabriano paper). The image interprets a photograph of Mitochondria, the Motherline DNA, from an old Scientific American photograph. She is currently completing a PhD in Australian Studies at the University of Sydney.